I don't talk about 'mom' stuff much on this blog - hence the name. But books? Books I can get into. Even parenting books. I'm sure most of you moms and dads have had them. Those moments when you're on your last nerve, there's a pile of laundry that appears to be multiplying, and for some reason your kids are refusing to eat their chicken nuggets? When you just want to scream, "FOR THE LUVVA ALL THAT IS HOLY, IF ONLY THERE WERE A FREAKIN' MANUAL!" 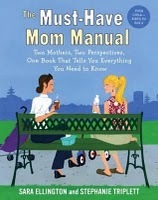 The Must-Have Mom Manual by Sara Ellington and Stephanie Triplett is, well, just that. It covers everything from breast vs. bottle feeding, to teaching your kids good values, to organizing your closets, to what to tell the kids when the family dog dies. It's all presented from both points of view, and the two authors couldn't be more different: one is super organized, the other is messy; one left her career to stay home, the other went back to work; one breast fed her children and the other bottle fed them. And yet they remain great friends, primarily because they believe in the theme of this book: that there are plenty of ways to be a good parent. No one choice is good for all families, and it's about time people started respecting that. A lot of this book is just good, solid, practical information. Secrets to make your hospital delivery more tolerable, tips for new dads, what to pack in your diaper bag, how to organize your car. And some of it is advice: take time for yourself, don't try to be perfect, keep the home fires burning. It's all delivered with spark and wit, and you get the benefit of at least two different perspectives (Sara: "Key rack! Shoe rack! Purge your clutter! Label it! Color-coded calendars!" Stephanie: "I'm gonna go have a cocktail while you alphabetize your daughter's Barbie collection."). Above all, it's very, very readable. At the end of each chapter is a short list of resources to make it easier for you to find more information. Sara and Stephanie offer up products they've found work the best, and cut to the meat of all the other popular parenting advice books out there, giving a fast little summary of what the book is advocating, so you can get an idea of whether it's "for you". It makes the overwhelming amount of conflicting information available to parents a little more manageable. Some of the chapters in this book don't really apply to me at the moment. I don't think my toddler cares where babies come from. And some of them may never apply to me (A whole chapter on going to Disney World? Really?). I was a little disappointed that certain things were never addressed (home births? Co sleeping? Where's the love for us hippie moms? ), but generally, there's something for everybody in this book. Obviously not all of the advice in this book is going to work for you ("Become an Early Riser"? Uh, hell, no). And that's kind of the point. There are lots of ways to be a good parent. There are lots of great suggestions, and if even a few of them are something you hadn't thought of yet, or saves you endless googling, then it's worth it. So, do you guys think you know it all? Or could you (or someone you know) use this book? I have one to give away. All you have to do is have a look at the book's chapter list and leave a comment telling me which chapter looks the most interesting or useful to you. For an extra entry, tweet about this giveaway. Be sure to leave me a comment with the link to your tweet (or include my twitter handle - @superkeely - in the tweet). And then, head on over to Nic at My Bottle's Up to read her review and enter her giveaway, too! We're all about the multiple perspectives around here. Uh, and the wine.